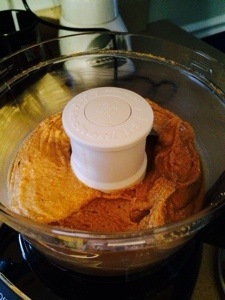 I am geeky enough to admit that my Kitchenaid Food Processor is one of my favorite things. I decided last summer that I needed one, and I had ridiculous ideas about buying the 13-cup Cuisinart chopping sensation. All the foodies at Williams-Sonoma insisted that was the one I needed. I mentally budgeted for the thing…well only sort of because I was also saving for Frye boots (and I wanted them more). While shopping around an outlet center, I managed to snag a refurbished 7-cup Kitchenaid model for only $59! My thinking was that even if it only lasted a year, I could see if I really would use it, then I could buy the Mac Daddy if I used it a lot. I use it ALL the time. ALL the time. And I have no plans to buy the big one. Usually, I’m cooking for just me or one other person, so if I make much more than what I already do, I have to throw it away. Also, who wants to clean that gargantuan thing? I make everything from cookies to chopped carrots with it. It works right alongside my new food dehydrator, too! 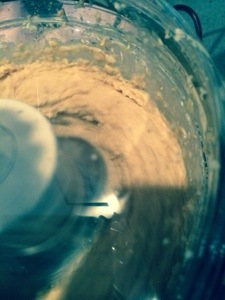 There are plenty of recipes to come that rely on the wondrous food processor. Instead of listing the hundreds of things you can do with it, here are a few tips on how you can get one of your own for less than the list price of $99! At Bed Bath & Beyond, use one of the 20% off coupons they basically throw at customers. That brings it down to $80! The Kitchen Collection store at Tanger Outlets has a varied selection of refurbished Kitchenaid products. It’s hit or miss, but if you can find one, you will save at least $30! This is where I got mine, and the lady told me that she prefers refurbished products because they have been closely inspected–even more than the new ones! Target occasionally puts these in the weekly ad at 20% off. I bought my mom’s this way. In addition, if you have a Target Red Card, you save an additional 5%. If you are a walking medicine cabinet like me, you can also use a pharmacy reward card to save an ADDITIONAL 5%. Great deal. I have some other ideas, but these are sure things! If you are interested and want some more ideas, let me know! If you take any cooking advice I offer on here, let it be this one. 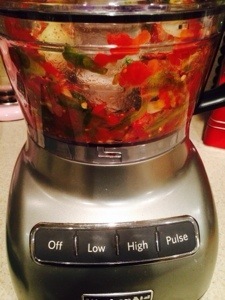 Buy a food processor. Now. You won’t regret it. And visit Andy Shardo’s often for yummy things to make with it!